Kitsune are rare and powerful otherworldly creatures, whose actual form bears an almost identical likeness to a fox. Their most unique physical feature would have to be their tails - Kitsune have been seen with any number from two to nine of these bushy things! They are thought to grow one new tail about every 100 years and, to a Kitsune, their quantity of tails can actually indicate several things: age, prestige, and magical prowess. Of all confirmed sightings of these beasts, very rarely have they been reported as looking the same amongst themselves. Their appearance, other than their common vulpine resemblance, tends to be rather different. Of note: it is rather amusing to remark that their favorite food is extraordinarily often tofu! These cunning fox-like creatures are extremely intelligent and most deceptive; considered exceptional tricksters by those who have encountered them. Although one should not trust a thing in the world when a Kitsune is in the vicinity, they are not necessarily nefarious or malicious. The Kitsune can be kind, helpful, and polite if their interaction with another soul aligns with their own beliefs and ethics; aggressive, seemingly evil, and disruptive otherwise. A Kitsune’s essence is thought to be very tightly tied to a specific element or elements. Drawing on the powers of that element, they become stronger and more healthy, almost vampirically pulling energy from elements around them to exist healthily in the physical realms and keep up their magical strength. This supernatural creature also tends to place a portion of their elemental essence in unembellished and modest-looking jewels called Soulgems. These jewel-like objects provide the Kitsune with power, strength, and physical well-being when outside of their own domain. The Kitsune have several powers and abilities that lend a hand in labeling them as tricksters and spirits. They have been documented as having magnificent control over Foxfire, the ability to shapeshift, a limited capacity for mind control, elemental energy vampirism, and there have even some accounts of possession by Kitsune. 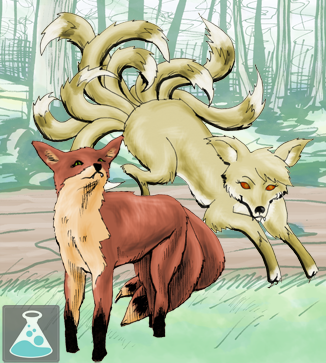 The fox-like beasts also have some ability of elemancy - the ability to manipulate elemental substances and energy that have properties associated with their elemental affinity. Their most notable and widely known ability is the creatures’ uncanny talent to generate near perfect illusions in the world around them. To the Kitsune and anyone experiencing these manipulations, these elaborate mirages become their absolute reality. Their similar skill in world manipulation, is very comparable to phantasmagoria - a bizarre or surreal incident that is much like a waking dream. Kitsune are able to make small pockets in reality, folding space and time to suit their needs and pull their Kitsune world into their current location. Time is said to flow differently than you would expect in these pockets, experiencing the span of a day over a few hours, or possibly losing years of time during a week inhabiting this strange space.